Help beat the gag on the BBC! …and linking to this pdf! See here (full blogpost) as to why. Merseyside Skeptics Society Stick the Boots in. 10:23pm on a Friday night - this is my rock and roll life. Due to moving house, I've had a month off blogging. Luckily nothing in the areas that I tend to blog about has happened in the last month. Oh, apart from the UK Parliament having an evidence check session on homeopathy which is brilliantly on YouTube, so you can watch some governmental weaselling and squirming at your convenience. Lots of good blogs have been covering this such as Ben Goldacre's Bad Science, Lay Science and The Quackometer. The upshot of the session was a glut of anti-homeopathy pieces in the press, such as The Sun's Homeopathy is a Resources Drain. (Sadly, there are still plenty of people who think sugar pills may cure AIDS). One of biggest gaffes from the session was by Paul Bennett, Chief Pharmacist of Boots who, despite selling homeopathic products in a manner contrary to MHRA regulations said he had seen no evidence for their efficacy, but sold them because "large numbers of [Boot's] customers thought they worked". This is nothing new in reality, the Quackometer blogged about this in 2006 and the Guardian ran a story on Boots & homeopathy in May 2008. The Boots brand is synonymous with health care in the United Kingdom. Your website speaks proudly about your role as a health care provider and your commitment to deliver exceptional patient care. For many people, you are their first resource for medical advice; and their chosen dispensary for prescription and non-prescription medicines. The British public trusts Boots. However, in evidence given recently to the Commons Science and Technology Committee, you admitted that you do not believe homeopathy to be efficacious. Despite this, homeopathic products are offered for sale in Boots pharmacies – many of them bearing the trusted Boots brand. Not only is this two-hundred-year-old pseudo-therapy implausible, it is scientifically absurd. The purported mechanisms of action fly in the face of our understanding of chemistry, physics, pharmacology and physiology. As you are aware, the best and most rigorous scientific research concludes that homeopathy offers no therapeutic effect beyond placebo, but you continue to sell these products regardless because “customers believe they work”. Is this the standard you set for yourselves? The majority of people do not have the time or inclination to check whether the scientific literature supports the claims of efficacy made by products such as homeopathy. We trust brands such as Boots to check the facts for us, to provide sound medical advice that is in our interest and supply only those products with a demonstrable medical benefit. We don’t expect to find products on the shelf at our local pharmacy which do not work. Not only are these products ineffective, they can also be dangerous. Patients may delay seeking proper medical assistance because they believe homeopathy can treat their condition. Until recently, the Boots website even went so far as to tell patients that “after taking a homeopathic medicine your symptoms may become slightly worse,” and that this is “a sign that the body’s natural energies have started to counteract the illness”. Advice such as this directly encourages patients to wait before seeking real medical attention, even when their condition deteriorates. according to the current legislation. Boots have since removed the product completely, however the Patient Guide to Homeopathy is still on the website. MHRA are now aware of this and so hopefully it too will disappear soon. 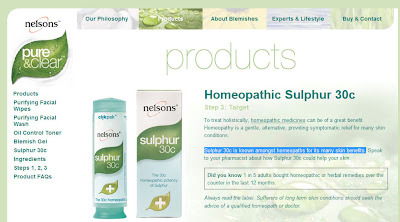 Not that it matters really, because Holland & Barrett are selling Nelson's Sulphur 30c pillules, complete with therapeutic indications, and completely contravening the law (original link to website here). The MHRA are now aware, and the offending site can be seen here. Indeed, even Nelson's own site (original site here) deems itself above the law by claiming that the product is "known by homeopaths for its many skin benefits" which is woolly wording in my book, but we'll see what the MHRA do. 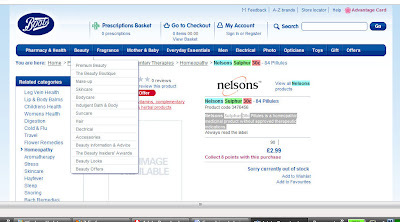 (Nelson's also promote the product with therapeutic indications on their Nelson's Homeopathy page here). Totally Hypothetical Remedy? - MHRA introduce certification mark for herbal remedies. This is the new Traditional Herbal Registration certification mark. Well, it is apart from the 'Warning', which is what I think it is lacking. indicates that the herbal medicine has been registered with the MHRA under the Traditional Herbal Registration (THR) scheme and meets the required standards relating to its quality, safety, evidence of traditional use and other criteria as set out under the Traditional Herbal Medicinal Products Directive (THMPD) 2004/24/EC. There have been 92 applications since the scheme began in March 06. Under this scheme, the permitted indications for the medicine are based on traditional usage and not on evidence of effectiveness of the product. My bold. So, as I wrote before with homeopathy, as long as the seller can demonstrate safety of the product and a history of use for the particular therapeutic indication, then it can receive the THR stamp and be sold legitimately, despite there being no investigation into whether it works or not. European Directive 2004/24/EC on traditional herbal medicinal products was brought forward specifically in recognition of the position that for many herbal medicines it was difficult for companies to meet the full requirements for a marketing authorisation, particularly in relation to efficacy. 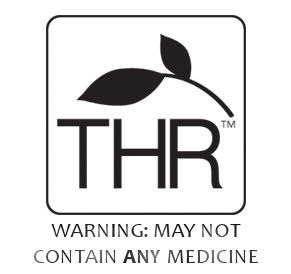 On a positive note, any product with this mark on it will single it out clearly and obviously to me as snakeoil - if it were a *real* medicine that, you know, actually had some effect, then it would be marketed as such and would have some evidence to back it up. So, perhaps we should look at this stamp as a victory for evidence-based medicine, as it singles out products without any provable efficacy for all to see. Back in July, I blogged on Glasgow Chiropractic's claims to cure asthma, carpal tunnel syndrome, colic and period pains. Following a complaint to the General Chiropractic council, Glasgow Chiropractic tweaked their website to remove some of their claims and to included a surprisingly truthful statement that "Chiropractic has never cured anyone of anything". Since then, they have completely revamped their website, bringing in a ChiroMatrix, a "leader in Chiropractic website design" with the strapline "Raising healthier families". Every person is unique, therefore everyone requires a customised wellness plan. The purpose of our wellness program is for you to achieve good spinal alignment, have a healthy diet, exercise, and maintain a positive mental state. Long termism, think more of the model of the dentist, rather than the doctor. Chiropractic does not 'cure' anything! If you are looking for a list of symptoms that Chiropractic has been shown to 'cure' then you will just end up more confused than when you started. 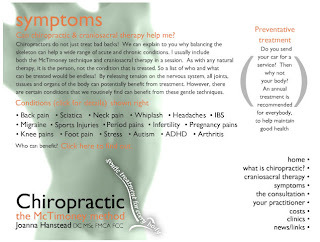 There are many 'conditions' that Chiropractic care has shown to provide assistance with. - there's glory for you! In order to prevent a rapid recurrence of symptoms, it is often necessary to continue receiving care even though your symptoms are gone. Do not be discouraged if you have mild flare-ups in your symptoms on occasion. This is normal. this phase of your care may last anywhere from a few months to a couple of years. A completely unfalsifiable statement, but a slick sales ploy nonetheless. Some of our offices are equipped with the very latest in technology designed to non-invasively test your nervous system very accurately. This technology uses a number of cutting edge techniques to give you a very detailed report on the integrity of your spine and nerves. These systems are called the 'Discovery Insight' or the 'Neuro-Infiniti' - please ask at reception about what technologies apply to you. Doesn't that all sound very sciencey and exciting! Here is a bit more information on the Discovery Insight Subluxation Station. (Bear in mind, subluxations are a very undefined woolly concept in chiropractic, with no real agreement about what they are, so how anything can 'detect' them is a mystery). From the ad, it was used by NASA - oooooh. The Chiropractic Journal has 23- year history of representing doctors of chiropractic and watching their backs. We will not sit by and see doctors taken advantage of by charismatic salesmen concerned and motivated purely by profit. One last bit on Glasgow Chiropractic, in case you had thought they had launched the "cure nothing/heal the person" Chiropractic 2.0 free of therapeutic indications, here is a photo of the Glasgow Chiropractic stand in an East Kilbride shopping centre, complete with old school (and removed from their website) claims of colic. I'll be sure to let the Advertising Standards Authority know. So either their stand or the website is talking rubbish. I reckon it's both. According to the Tobacco Manufacturers Association consumer spending on tobacco products in 2007 amounted to £12.6 billion. This led to tax revenue amounting to £9.9 billion - £8.0 billion in excise duty plus £1.9 billion in VAT. Then there's the aftermath - according to Medical News Today, the global smoking cessation aids market is to reach $2.6 billion By 2010. Quite the lucrative industry all in all. There are all manner of products to try and wean the addict from the evil weed, with varying degrees of success, but surprise surprise, they all require will power and rely on the person concerned having a genuine desire to give up. It shouldn't really come as a surprise for this to be a booming industry. It is notoriously hard to give up, compounded by the fact that people know it is notoriously hard to give up and that provides its own psychological barriers. To be cynical for one second, a product which relies on will-power (regardless of whether it is Big Pharma or Big Quacka), will help to ensure repeat sales from people who won't give up giving up, and keep the tills ringing for many a moon. This is happy home turf for homeopathy - a placebo remedy that depends largely on the psychology of the person, and not at all on the sugar pill. Failure is due to lack of will-power, success is due to homeopathy. FTW! Despite it being illegal to sell homeopathic products in the UK with therapeutic indications (unless licenced by the Medicine and Healthcare product Regulatory Agency), it is possible to buy homeopathic products marketed at the smoker. How about a homeopathic anti-smoking spray from Smoker Stop Shop? Spray away your cravings (for tobacco smoke or chewing tobacco) with Smoke Control homeopathic oral spray. It helps with nervousness, anxiety and irritability when quitting. It can also help with cough or shortness of breath, difficult breathing and the sensation of weight on your chest from smoking. Seems like pretty straightforward indications for homepathic products to me. For the interested few, I'm led to believe that 4x dilution is equivalent to a 2c concentration. This means that 1 drop of the mother tincture has been diluted in 99 drops, hit against a magic board (succussed) and then a drop of that taken and diluted in another 99 drops and succussed again. This means that although the product is dilute, there is still some 'active' in the sugar pill. i.e it's not a homeopathic remedy in reality, it's only labelled that to pass US Food and Drug authority regulations. This crazy loophole which means that products containing 'actives' can be called homeopathic and thereby politely excuse themselves from the rigours of normal drug testing. This can mean that the untested pseudo-homeopathic products have massive unknown negative side effects and cause problems in the users - ZiCam is the most recent example. A pseudo-pseudoscience, if you will. This can lead to all sorts of wacky products like homeopathic nicotine water being sold (I'm sure I can get hold of some bong-water and sell that?) - but only in US, right? Our strict laws wouldn't allow such quackery to be sold in UK? The importation of medicines by individuals for their own personal use or for use by a family member is exempt from regulatory controls, and this includes purchases from the internet. Dawn Primarolo signed the letter. Trading Standards have recently been warning people about false confidence in '.co.uk' websites with consumer goods - surely untested imported medicines with their uncontrolled, unregulated ingredients should be given higher priority than a few knocked-off hair-straighteners? So who runs the Smoker Stop Shop (www.smokerstopshop.co.uk)? That is one Penelope Walford, who runs a private clinic in Harley Street and refers to herself as a 'smoking cessation specialist' using hypnotherapy as her main tool. We have not shown that hypnotherapy has a greater effect on six month quit rates than other interventions or no treatment. So how can Penelope Walford sell homeopathic products in the UK with therapeutic indications, which is against the law? I've asked MHRA the same question - I'll let you know the response. The idea that homeopathy can do something for smokers to help them kick the habit is quite widespread. Other UK-based companies that seem to be up against the law are The Body and Mind shop and i-Quit, with the media, helpful as ever, to give a hand to evidence-free nonsense. Yet surprisingly, few of them seem to require the major magic ingredient that known to give results - willpower. Just in case you haven't been to your chiropractor in the last little while due to the recession, there has been a maelstrom. Science writer Simon Singh wrote an article for the Guardian which the British Chiropractic Association claimed libelled them and so went the way of the courts. Justice Eady decided there were words used which conveyed a meaning which Singh had not intended, but that the case should go to trial nonetheless. Singh is appealing the decision. In the meantime, the searchlight of skepticism was directed towards chiropractic. Hundreds of complaints were sent to the General Chiropractic Council meaning the GCC were unable to cope with the volume of complaints and causing some chiropractors to rapidly remove or rehash their websites, with some of them throwing in the towel and admitting that Chiropractic has never cured anyone of anything. Sense about Science has been working with Singh to campaign to keep libel laws out of science. As part of that, they have arranged for Singh's original article to be scanned by lawyers, have the few words removed that were called into question, so that the article can be reprinted without fear of libel. The important point of this article is that, the whole feel, meaning and impetus is unchanged by the removal of a few contentious words. The thrust of the article is the statement of fact that there is little/no evidence for most (all?) of the claims of chiropractic. I am pleased to reprint the lawyer-friendly article below - it should also be noted that the BCA have no issue (and therefore tacitly agree with?) everything in the article below. ...yet funny enough toothpicks are just as good as acupuncture needles for providing relief of lower back pain. but evidence-based healthcare knowledge collater, Bandolier has written a plain, easy-to-digest synopsis of the paper here. This large trial involved 638 adults, with follow up of 90% or above up to 52 weeks. Participants had an average age of about 47 years, with about 60% being women. About 70% had back pain for at least a year. The average initial RMDQ score was about 10.5 on a 0-24 scale, and average initial bothersomeness score 5 on a 0-10 scale. * There was no difference between individualised acupuncture, standardised acupuncture, or sham acupuncture. * RMDQ scores fell from 11 to 6 for acupuncture of any sort by 52 weeks, compared with 7.9 for usual care. Any form of acupuncture was better than usual care. * Bothersomeness scores fell from 5 to 3-5 to 4 for all four groups, with no difference between them. * Use of medications (about 65% at baseline) fell to 47% with acupuncture, but remained at 59% with usual care. * There was no difference in SF-36 mental and physical component scores. * Cutting down on usual activities for more than seven days in the last month at 52 weeks was more common with usual care (18%) than with acupuncture. * More participants with usual care missed work or school for more than a day (16%) than with acupuncture (5%-10%). * There was no difference in total costs of back related health services between groups ($160-$221), though costs of acupuncture were not included. * Adverse events occurred in 12/315 with real acupuncture, compared with 0/162 for simulated acupuncture, with one serious adverse event for real acupuncture. * One patient in the usual care group went on to have back surgery. There are a few interesting things that came out of the study. The difference between standard care and intervention is significant, and confirms previous discussions suggesting the more theatrical the intervention the larger the placebo effect. Secondy, the cost comparison is interesting - no real cost difference, and indeed acupuncture costs weren't included. So even the 'cost effective' argument is unfounded. Thirdly, adverse effects - one serious adverse effect and 12 lesser, compared with zero for the toothpicks. This means about 4% of the patients had an adverse effect from a treatment which had absolutely no demonstrable benefit compared to toothpickery. So let's see: there's no patient benefit, no cost benefit and increased risk of adverse effects. So why are NICE approving it for lower backpain? Perhaps I'll drop them a line. According to a letter shown to this blog, the General Chiropractic Council has written to complainants and chiropractors saying that it can not cope with the number of complaints it has received (590 last month compared with 40 per year). it will be necessary to increase our regulatory staff capacity before we issue formal notification of any complaints relating to chiropractic websites. The lack of staff will delay the commencement of the formal process until September 2009. The increase in complaints was due to the British Chiropractic Association's attempt to silence criticism about claims for chiropractic being an evidence-free zone. If the BCA had been a bit less foolish, it could have avoided this whole debacle, but it appears that it was spoiling for a fight, and is looking pretty groggy. Chiropractors admit "Chiropractic has never cured anyone of anything"
PLEASE NOTE Since writing this blog, Glasgow Chiro have revamped their webpage, hence some of the links may no longer work. A more recent article on Glasgow CHiro's website can be found here. Recently, I blogged about Glasgow Chiropractic changing their website to remove references to colic. A specific complaint about the contents of their website had been sent to the GCC and so, using www.changedetection.com, I was able to see how Glasgow Chiropractic would react. As a pleasant surprise, the chiropractors seem they have come over all hand-wringy and repentant and have updated their website accordingly. The change detection page for menstrual pain is here and the one for shoulder pain and carpal tunnel syndrome is here. You can see the changes made by clicking on " View changes: 2009-07-08 13:57" about half way down on the left hand side. Chiropractic has never cured anyone of anything. Quite an admission, although one that is completely backed up by research data. If we go looking for the named condition that Chiropractic can be applied to and produce change in we will find ourselves in a merry-go-round of symptoms, loosing [sic] sight of the whole because of an obsession with the parts. So the question of What can Chiropractic Cure should be changed to "How" can Chiropractic Assist? The answer is simple. A well functioning mind and body has a greater opportunity to heal, repair and function than a poorly functioning one. A well functioning mind and body depends to a significant degree on a well functioning spine and nerve system. This is Chiropractic's contribution. People find that chiropractic's ability to produce better spine and nerve system function changes their life expression. There are thousands of symptoms and conditions that chiropractic has been associated with helping, however don't ask "Can Chiropractic Cure this or that condition" - instead ask "If my mind and body was functioning better through Chiropractic would I be better placed to handle this condition?" Have you got that? Don't ask "can chiropractic cure". Just don't. Ask a different question if you must, but don't ask if it can cure. When helping (treating) women who suffer from dysmenorrhea, the majority of chiropractors address only problems located in the areas directly involved in causing the symptoms. In a study conducted to establish which styles of Chiropractic care (treatments) are most frequently used by chiropractors for dysmenorrhea, manipulation was used in 100% of the cases. Read that last sentence again in its old and new forms - the meaning has been changed to the point of silliness. Although perhaps they are now referring to a different study? Who knows. A chiropractor’s role is to normalise the functions of the body by correcting spinal problems. The rationale behind the chiropractic management (treatment) of women suffering from dysmenorrhea is to deal with (treat) its spinal and skeletal aspect. Chiropractic provides the mechanisms through which dysmenorrheic women can be relieved of their pain in a drug-free environment and even go on to live a life free of period pain. How (What) can Chiropractic assist with (a Chiropractor do for) menstrual pain? Your chiropractor will perform a complete consult and examination and may take radiographs (x rays) if clinically required.). After review of the examination findings your chiropractor will recommend an appropriate and individual care program. Chiropractic care (Treatment) consists of specific manual adjustments, to the individual joints of the body and spine, which restore damaged neurologic function. As Grey’s Anatomy text states every single organ in the body is controlled by the nervous system. This includes the uterus and reproductive systems. Through the specific adjustment your chiropractor provides neurological input (imput) that allows your nervous system, and so your organs, to adapt to environmental stresses. So by changing the word 'treat' to 'help' or similar, that makes it all ok. It's good to see that the X-rays are now only done 'if clinically required'. Will that ever be the case if chiropractic has never cured anyone of anything? Just off so no time to blog this properly, but back in May I blogged about the Medicines and Healthcare Products Regulatory Agency giving their blessing to Nelson's selling homeopathic arnica with therapeutic indications. The full report is now published and can be found here. four times daily until symptoms improve for up to a maximum of 7 days. where Arnica had been administered in a number of clinical conditions. operative clinical actions of arnica, such as pain relief and bruising. towards demonstrating some beneficial effects of arnica in some situations. I'll be contacting the MHRA as they seem to have omitted an important safety concern - how do I know that what is in the pack is what is on the label? Both you, I, MHRA and Nelson's know it is impossible to tell. This is how the CNHC website looked on May 21st 2009 and here's how it looks now - see the difference? I had previously written to Ben Bradshaw MP regarding CNHC, got a largely unsatisfactory reply and have to-ed and fro-ed again since then. One of my main issues was that the quack health lobby group, Prince Charles' Foundation for Integrated Health, had received £900,000 of Dept of Health funding (my and your taxes) to set up CNHC and yet, they were being opaque as to their operations. Seemingly by mistake, a CNHC staff member put the minutes of the Nov 08 meeting on the web, which contained discussions about 'misinformation on a blog' and infiltrating websites to promote CNHC. I should point out that the CNHC have stated the minutes were not OK-ed by the board and contained inaccuracies. At the time of writing, those minutes are still available on the CNHC website here(.doc file). In order to meet our commitment to transparency, CNHC will make the minutes of board meetings appear here. a synopsis of items for discussion and decision would be put on the website. Seemingly, no need to update the website though. More muddle and confusion. One of the CNHC key objectives is to register 10,000 therapists by end of 2009, although I'm lead to believe the number is currently around 2,000. Various amendments and changes were agreed. I never did find out what they did with that £900,000. The Guardian brings all the nerds to the Yard, and they're like "it's quackery, yeah?" With apologies to Kelis, and it doesn't even scan. Anyway, not even a badly constructed blog title could take away from a funny little PR-disaster which happened today to Neal's Yard, courtesy of the Guardian and an internetful of geeks (that's the collective noun, surely? - feel free to provide suggestions below). Neal's Yard Remedies, the super-ethical, eco-aware health and cosmetics company, had agreed to take part in a Guardian series called "You ask, they answer". In this feature, in the Ethical Living section of the Guardian, internetians were offered the chance to ask Neal's Yard Remedies any question they wanted, although they were generally supposed to be regarding organics and beauty. it nicely teed up a complete pwning of Neal's Yards' quackery division. Now perhaps you haven't been taking your Co-Enzyme Q10 pills (this link may be more useful) or your 100% Organic Pre-Sprouted Aktivated Barley Powder so perhaps you've forgotten that Neal's Yard was the subject of a BBC documentary, investigating the sale of homeopathic prophylaxis for malaria. Unsurprisingly, they were concerned that Neal's Yard were selling an evidence-free sugar pill to protect people from a potentially fatal disease (doesn't seem very ethical to me). There is a transcript of the article here and the YouTube version of it is here. It includes the bit where Susan Curtis, Neal's Yard's Medicines Director storms off in a huff after being made to look extremely foolish. The BBC investigation reported Neal's Yard to the regulatory authorities (MHRA), who promptly spanked their bottoms and forced them to remove the product from sale. have just had a chat with [Neal's Yard Remedies]. Unfortunately, despite previous assurances that they would be participating in this blog post, I've now been told they 'will not be taking part in the debate'. So yes, as several people have pointed out, this has become something of 'You Ask', rather than a 'You Ask, They Answer'. I'm still hoping NYR will reconsider. We have tried again to convince NYR to respond to your comments but they have reiterated their position that they do not wish to enter the debate. We will keep trying to change their mind, but if they stick to that we will be closing this thread in a hour at 15.00 BST. Neal's Yard have scored a massive own goal - an epic fail and a prime case study for "How Not To Do PR". They've cried off, seemingly unable to salvage anything from the situation and deciding the bunker was the best place to be. HolfordWatch is contacting Neal's Yard to see if they would like to continue the conversation there - seems unlikely, but we'll see. Chiropractic for menstrual pains? No evidence. Period. I'll hopefully convince you by the end of this blogpost, that there are bogus chiropractors in the UK. Menstrual pain (or to give it its posh name, dysmenorrhoea) is estimated to affect between 45 - 95% of women at some point. (Bit of a rubbish estimation, if you ask me, but it gives an idea of its occurrence). Here we have a condition which is widespread, can be debilitating, can be chronic, and the main respite from which is through painkillers. A perfect combination for a theatrical placebo. (And a cynic would add it was a regular monthly income). [Pringle Chiropractic] are aware that many women who suffer from menstrual cramps also experience frequent back pain. Is there a connection? Both may be related to subluxation in the lower spine that affects the nerves that serve the female anatomy. a loss of function in the spine and nervous system due to a reduction in its normal motion or alignment. - from Pringle Chiropractic, Belfast again. And what, amongst other things do Pringle recommend for menstrual pain? Good, old fashioned chiropractic adjustments. Age < 30 years, low body mass index, smoking, earlier menarche (< 12 years), longer cycles, heavy menstrual flow, nulliparity, premenstrual syndrome, sterilisation, clinically suspected pelvic inflammatory disease, sexual abuse, and psychological symptoms. which is pretty much a statement of cure. It's a fairly widespread chiropractic claim to be able to assist in menstrual pain - a quick squizz on Google shows that alongside Pringle Chiropractic, Belfast and Glasgow Chiropractic, Tooting Chiropractic, Townhill Total Health, Bank Chambers Clinic in Chipping Sodbury and Newcastle Chiropractic to name a few, also insist that chiropractic can assist in some way with menstrual pain. So, given that there is a widespread belief within chiropractic circles that it can cure or relieve dysmenorrhoea, what decent evidence exists to back this up? It should come as no surprise to anyone who knows anything about chiropractic that the answer is "not a jot". Overall there is no evidence to suggest that spinal manipulation is effective in the treatment of primary and secondary dysmenorrhoea. There is no greater risk of adverse effects with spinal manipulation than there is with sham manipulation. The Clinical Evidence section of the BMJ places Chiropractic in the "Unlikely to be beneficial" category for dysmenorrhoea. Currently, there is no evidence that spinal manipulation helps to relieve period pain. The NHS page quotes the Cochrane review above and follows its conclusion. What about the General Chiropractic Council? Does it recommend chiropractic for menstrual pain? benefit may also be seen for some types of asthma, digestive disorders, migraine, infant colic and menstrual pains. You may also see an improvement in some types of asthma headaches (including migraine) and infant colic. It seems clear that following the publishing of the Cochrane Review, in 2006 showing that chiropractic had no demonstrable effect on menstrual pain, the GCC (in an attempt to show it was evidence-based) removed menstrual pain from its list of treatable disorders. That means the GCC, the UK regulator of chiropractics, is fully aware that dysmenorrhoea cannot be treated successfully with chiropractic. No doubt it will have made every effort to communicate this to its members and ensure that no-one was claiming otherwise. I'll be arranging for complaints to be made to the GCC regarding the above chiropractor's claims. I now suggest to you that, given the evidence above, any chiropractor that suggests that chiropractic is a worthwhile therapy for menstrual pain is bogus. Period. Chiropractic - totally bogus, dude? The word 'bogus' is back in vogue - and not before time. 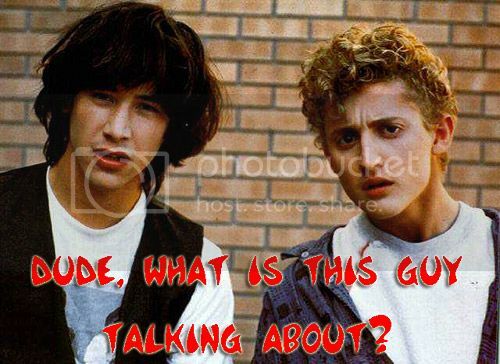 It's been 18 years since Bill & Ted's Bogus Journey hit the big screen and had all teh kidz talking like west coast surfer dudes. The British Chiropractic Association claims that their members can help treat children with colic, sleeping and feeding problems, frequent ear infections, asthma and prolonged crying, even though there is not a jot of evidence. This organisation is the respectable face of the chiropractic profession and yet it happily promotes bogus treatments. In the usual manner of Complementary & Alternative Medicine, the BCA decided to sue for libel rather than entering into a rational discourse regarding evidence or the lack thereof. At the time, it wasn't apparent what the offending part of the article was, just that it was happening, hot on the heels of another legal chill from New Zealand Chiropractors to David Colquhoun. [The Judge continued that] The word "bogus" meant deliberate and targeted dishonesty. So it did not mean that chiropractic for the six named children's ailments (including asthma) was simply wrong, or that it was contrary to established medical practice or research, or even that it completely lacked evidence. "Bogus" meant a lot more. The judge held that by the mere use of the word "bogus" Simon Singh was stating that, as a matter of fact, the BCA were being consciously dishonest in promoting chiropractic for those children's ailments. [...]The ruling means that, as it stands, Simon Singh would have to prove at full trial that the BCA were being deliberately dishonest. This is not only extremely difficult but it was undoubtedly not Simon Singh's view in the first place. The BCA, as with many CAM practitioners, may well be deluded, irresponsible, and sometimes rather dangerous; but calling their promoted treatments "bogus" was not an express statement of their conscious dishonesty. A Facebook site has been set up and on Monday 18th May in London, there was a collective show of support for Simon Singh, with Dave Gorman, Evan Harris MP, Nick Cohen and Brian Cox all speaking, as well as Simon himself. The Quackometer is setting up a Carnival of Bogus* Chiropractic to promote the fact that there really is little evidence for chiropractic at all, never mind the more exotic claims of colic, athsma and others. This section lists alphabetically a number of conditions that may be alleviated by the therapeutic specialities shown. Many complementary therapies are not condition specific but treat the “whole person”, making it difficult to accurately list conditions alongside a therapeutic approach in this way. Asthma - Various therapists use [...] chiropractic. The review found there is not enough evidence from trials to show whether any of these therapies can improve asthma symptoms, and more research is needed. Bedwetting (childhood) - Complementary treatments such [...]chiropractic may help, but the evidence was weak. Remember this is chiropractic - mainly spine manipulation. Despite claiming all these diseases can be alleviated with chiropractic, there are few Cochrane reviews to confirm their claims and the ones that are available are not very positive. How can Healthcare 2000 claim this? They must have some idea of evidence to show efficacy, I mean they wouldn't just make it up, not knowingly anyway, because that would mean their claims are bogus (according to Justice Eady). This business with the BCA will undoubtedly have the same effect (known as the Streisand Effect) which is to blast the news round the world via the internets that BCA want to silence dissent about chiropractic. This will in turn shine a skeptic-ninja searchlight on the chiropractic industry and show that the evidence for any of it is weak to non-existant. * - deliberate deception not implied.